The London Dance Umbrella Festival is running from 11th to 28th October at venues including Sadler’s Wells Theatre, Trinity Buoy Wharf and Battersea Power Station. 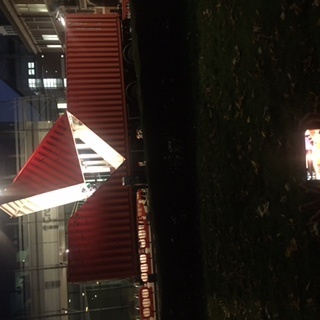 On Saturday 14th October, it arrived in the Queen’s Gardens, central Croydon, as part of Croydon Dance Festival, a day long event held close by in the Braithwaite Hall. One outdoor Umbrella performance, entitled ‘Origami’, had taken place earlier in the afternoon. The second show was at dusk, just as the lights of Bernard Weatherill House, its backdrop, were starting to come on. A red container lorry had parked in Fell Road, then its cab detached to leave just the casing. 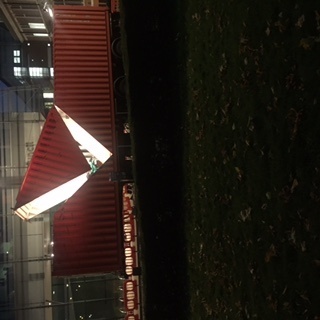 This red metal shell unfurled as the music started, then appeared to be folding like paper, as in the Japanese art of origami which gave the performance its name. 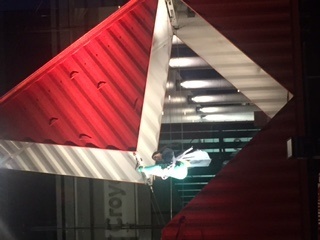 The casing was continuously manoeuvred to create a changing set for a solo female dancer, Satchie Noro – although ‘dancer’ doesn’t capture the complexity of her performance; she was part rock climber, part gymnast and part circus artist. The show was a strange and mesmerising duet between woman and metal contraption. Its imagery was of escape. At times Noro seemed to be an insect, casting off an outer garment like a caterpillar’s carapace, or struggling like a beetle on her back. One moment the insect resists her cage, at others she accepts entrapment. She walks wires, swings from a bar and reaches out into the night sky with her shadow thrown upwards on the side of Croydon town hall. Then she becomes human, striking hammer blows – with an actual (very large) mallet – on the roof of the container, as though to incite the watching crowd to revolution. Origami also rose above distractions both delightful and annoying. There was a captivated little boy at the front, intently imitating Noro’s movements, then an animated conversation between three people drinking from beer cans until asked by the organisers to desist. In Bernard Weatherill House, a mystery shadow-performer got in on the act, switching on the lights in his/her office, pulling down the blinds then switching the lights off again, oblivious to the drama outside. Croydon Dance Festival was supported by Croydon Council and curated by Anusha Subramanyam and Vipul Sangoi of Beeja. Its programme of contemporary dance performances by both local performers and national artists featured Archana Ballal, the BRIT School, Corali, Magpie, Saturday Storytellers, Shane Shambhu, Shivaangee Agrawal, SLiDE, Tom O’Gorman and Vinicus Salles. I didn’t see the Braithwaite Hall performers, and only wish that I had: ‘beguiling’, ‘intriguing’ and ‘amazing’ are some of the words used on social media to describe them. Just one more, really important thing. We were so very lucky that this was on in Queen’s Gardens for free. As we prepare Croydon’s case to be London’s Borough of Culture in 2019, please let’s go large with publicity when something’s this good. *So* wish I had seen this! (Not for a lack of publicity, we were away). Struggling like a beetle on her back sounds kafka-esque? Indeed so! And I loved the idea of dancing with a lorry. And the folding paper thing. The opening moments of this were quite remarkable. Although in real life, it happened the right way up…….